Hello! My name is Jay Weston Hannah. I'm a computer geek currently living in Omaha, NE, USA. My homepage is http://jays.net and my email address is <jay(at)jays(dot)net>. This is my fault, so I'm your point of contact for additions, corrections, removal, complaints, etc. 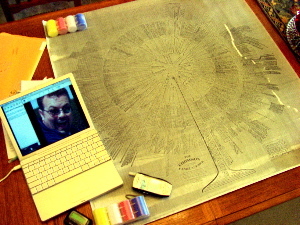 2005 genesis: Earlier this year I was inspired to take up genealogy as a hobby. Mere months later with much help from genealogy genius relatives of mine, family trees lying about, conversations, and lots of data entry I've compiled over 4000 of my relatives into my genealogy database (GEDCOM). 2014 update: Sadly, both of my cousins, from whom this data originated, have now passed away. RIP uncle Larry and aunt Kandi. A lot of Kandi's data is also on TribalPages. We also have a FaceBook group. My Great Great Great Great (GGGG) Grandfather Hannah was James C. Hannah. My Grandfather Earl Chapman Humphrey served in World War II on the USS Houston CA-30 and was a prisoner of war for 3 years. He was also great at bouncing me on his knee and I miss him. Also see "Thomson Family History" below. It starts at William. June Sparks (junetsparks(at)cableone(dot)net) says: The original of this tree hangs on the wall in the library of Wabash College, Indiana. The Rev. John Thomson is one of the original founders of the all men's college. He held a meeting in his living room where the founders for Wabash met and put it all together - based on protestant principles. My GGGGGGGGGrandfather was (probably) William Stark, born somewhere around 1637. The Chapman family bible that is currently in my grandmother's possession is an amazing book. It's huge, like something from a movie set, and contains the family and descendants of George Chapman. 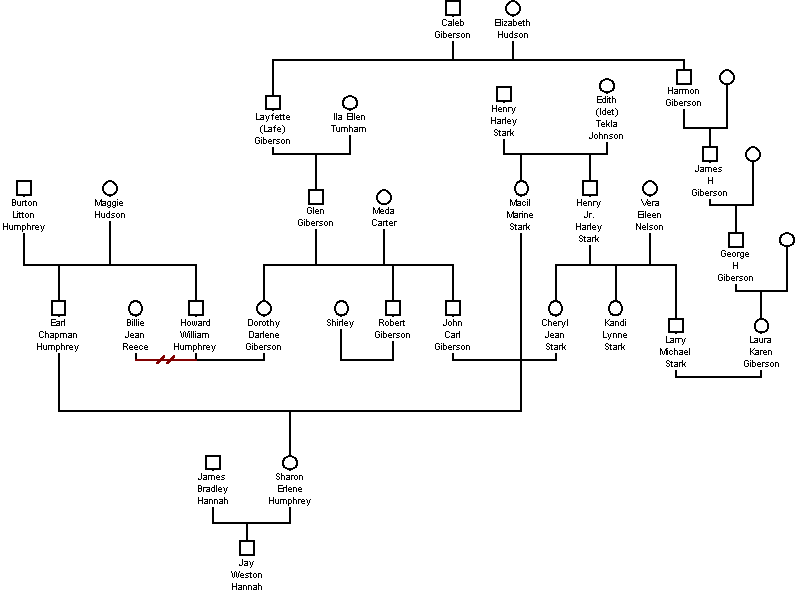 When Giberson cousins married Stark siblings they caused a confusing pretzel shaped chart. My loving family, in all directions, that never fail to support me. Thanks, all! SeeGECOMX - I do all my editing with this program on my Mac. gedcomToHTML - Creates this website from my data (written in Perl). Gedcom.pm - Perl module I played around with. GenoPro - Makes cool graphs (of a few hundred people max on my craptastic Win98 PC. We exchanged emails in Jan 2006. We exchanged emails in Apr 2006. We exchanged emails in Sep 2006.